Introduced in 2011, the IMPACT model is a multi-use free-ride shoe. 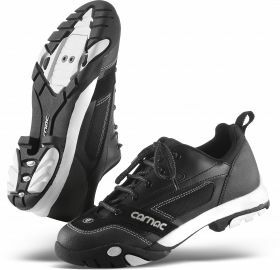 It has been carefully designed to ensure a robust technical shoe without sacrificing comfort. The outer sole is in dual-density rubber : while the area in contact with the pedals is in a stiffer material, the areas where grip is more important are made of more flexible rubber. Uppers in synthetic P-Skin and reinforced canvas. Internal reinforcement shells as the front and back.